← Don’t Forget, Milan No-Till Field Day is Thursday! The Problem with Insects is …. 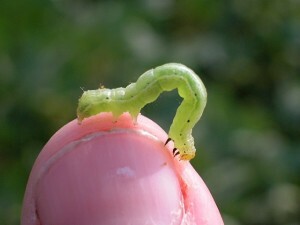 Author: Scott Stewart, IPM Extension Specialist Comments Off on The Problem with Insects is …. Insect pests are irritatingly unpredictable about when, where and how bad infestations will be. But there are patterns that repeat themselves annually. Infestations of tarnished plant bug, stink bugs, and bollworms often peak the last week of July and the first 2 weeks of August. And of course, this is the time when plants are very susceptible to fruit injury. This means there is a need for intense scouting, and there is a high likelihood that insecticide applications will be needed. Most calls I’m receiving are related to plant bugs and bollworm. Bollworm infestations in cotton are not especially high in most areas, but infestation levels appear to be increasing from the south and west. I suspect next week will be the big spray window for bollworm on Bollgard 2 and the original WideStrike technologies. Early cotton in the more drought areas may out run the moth flight. Cotton fields become substantially less susceptible to insect injury once it accumulates 350 DD60s past cutout. Once you reach an average of NAWF=5, it generally takes 16-19 days to accumulate 350 DD60s, depending on the temperature. At this time, you can relax in managing insect infestations. I’m getting calls on multiple pests including green cloverworm, bean leaf beetles, stink bugs, and corn earworm (bollworm). In some cases, green cloverworm infestations are running 100-150 larvae per 100 sweeps, which is a range that you would expect to cause 20% defoliation or more (which is the defoliation threshold from R1 – R6). With the exception of green cloverworm, there are some real obvious patterns to keep in mind. 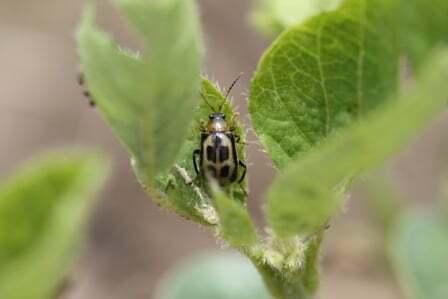 Bean leaf beetle populations tend to jump on soybean during the R5 and R6 growth stages, and the biggest populations in Tennessee often occur along the Alabama, Mississippi and Arkansas border. Although we have a threshold of 2 beetles per sweep, I generally suggest using defoliation to trigger applications. Fair warning that these are mobile critters. Reinfestations can occur quickly after an insecticide application. Stink bugs typically start infesting fields at about R3 and later. It’s pretty unusual to reach the threshold level of 9 stink bugs per 25 sweeps until nymphs are established, and that is almost always after beans have reached R5. At the end of the season, late maturing fields can be a sink hole for stink bugs. 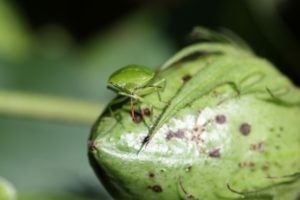 In Tennessee, green stink bugs typically compose 80% or more of the population, which is good news because they are relative easy to control with pyrethroid insecticides. If you jump the gun and spray on the front end of their migration into the field (e.g., R3), you often don’t accomplish much in the long run. Pyrethroid applications are a good way to flare infestations of corn earworm, loopers, and spider mites. Don’t make unnecessary applications! 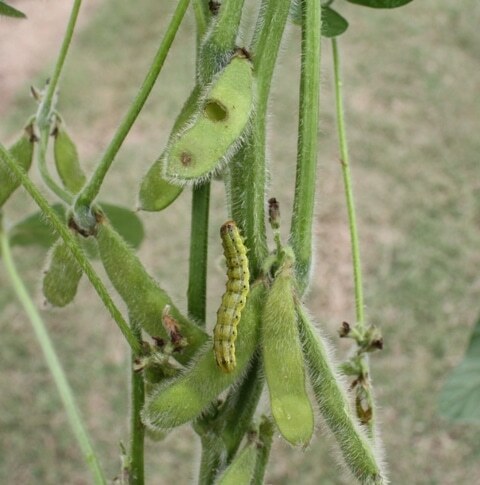 The risk of corn earworm infestations is greatest in late planted soybean, especially those that begin flowering in late July and early August, just as the moth flight begins to peak. They are most attracted fields with open canopies during the early blooming window. Although economic infestation can occur anywhere in the state, they are typically far more common in the delta (river bottom) areas of West Tennessee. Fields at R4 and R5 are much less likely to be infested, and especially if they have a lapped canopy. Finally, soybean looper infestation are most common in during late August and September in Tennessee, so again, late maturing fields are going to be most attractive and susceptible to defoliation. 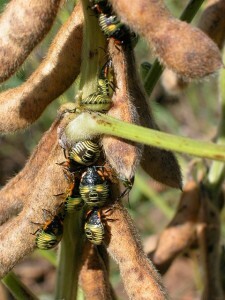 Similar to stink bugs, infestation often begin to peak around R6. However, those infestations that begin earlier can have a major impact on yield. Be aware that pyrethroid insecticide application made earlier in the season for other pest increase the chances of having a looper infestation. Fortunately, Tennessee tends to be hit or miss on soybean looper infestations. This pest migrates in from the south, and it often arrives too late to cause significant widespread problems. August is a critical month for insect management in cotton and soybean. You should be done with cotton pest management by mid-August for early maturing fields and late August for later maturing field. However, we will have to remain vigilant on late maturing soybean fields well into September.